Why You Should Play Khan Wars X? Rate this Article Real time strategy MMOs are a dime a dozen on the internet. However, when you are able to find a special MMORTS, you don’t simply forget about it even if you have moved on to a new game. One such game is Khan Wars... or as it is now known as Khan Wars X. Real time strategy MMOs are a dime a dozen on the internet. It is, in fact, pretty difficult to find a game that has something fresh and unique to offer. However, when you are able to find one of these special gems, you don’t simply forget about it even if you have moved on to a new game. One such game is Khan Wars. We’ve recently revisited the game and to our delight, the game has made huge strides in its development. Now named as “Khan Wars X”, the game has essentially been revamped for the better while simplifying a lot of its more complicated processes. Let’s take a look into this new version of the game! To start, you’ll first need to select a world to join. Like its predecessor, each world has a starting and an end date. Worlds with a more recent starting date are usually more suitable for newer players since start off on a more or less equal footing. Starting on a world that has been going on for months means you’ll need to catch up really quickly, which is admittedly perfect for veteran players who are looking for a challenge. However, you no longer get to choose a nation at the beginning. Instead, you’ll be given the choice once you reached level 7. Being an MMO strategy game, Khan Wars X offers plenty of opportunities for you to build up your empire. Your city is basically constructed for you once you join a game. However, it is up to you to continue the development of your city and to help it grow. Each building can be upgraded multiple times, allowing you to increase their efficiency, or in the case of military buildings, allowing you to recruit new units. Interestingly, the game is also incredibly generous when it comes to allowing you to speed up the upgrading process for free. Khan Wars X has a nice selection of soldier types as well, ranging from your common infantry right up to siege weapons and special units like noblemen. 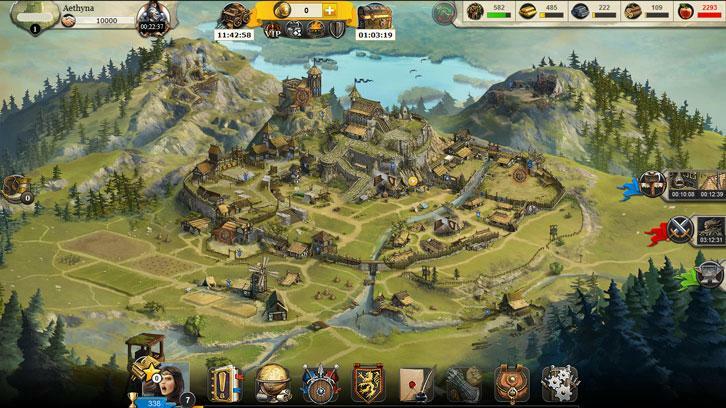 Similar to the buildings in this game, each of these units can be upgraded multiple times via the blacksmith. You’ll also need to have a Knight to lead your troops into battle and you can recruit one at the Royal Court. Knights level up independently from your empire and you can do so by sending them off on expeditions. They can even be equipped with armor and weapons to increase their stats and hence, their combat potency. Like Khan Wars, every level up you get in this game will earn you 1 skill point. These points can then be invested into a wide range of nation skills, which will passively boost a certain aspect of your empire, be it your economy, your troops’ stats or morality, or the overall experience gained. Each skill can be ranked up 3 times. The combat system in Khan Wars X retained its unique strategic aspect, such as arranging your defense and attack formations prior setting off on a campaign (of war). However, there are also a couple of new stuff added to the game. For instance, you can now set up camps on the world map and send your troops on patrol. The bandit camps on the world map may also send their forces to attack your city from time to time just so you are kept on your toes at all times. Another interesting addition that the game has made is the Arena mode. Unlocked at level 9, the Arena allows you to fight other players in ranked combat. Of course, aside from Arena, you can still attack other players on the world map as long as your level is not too high and that you’ve reached the minimum level required to unlock the PvP feature. The game encourages socializing and forging of alliances too. You can interact with other players in a friendlier manner (as opposed to invading their empires) through the in-game chat system, in-game messages, or by joining a clan which will unlock access to the clan market, clan wars and more. Among the changes done in Khan Wars X, the modifications to the game’s graphics definitely win the most points. The empire that you get to build in this game looks so much more beautiful. The game interface has also been drastically upgraded, giving the game a more polished look and making navigation so much easier. If you love playing Khan Wars X, you might want to consider to purchase a VIP membership using the premium coins you bought. There are many perks of being a VIP, including faster campaign speed and Arena attempt recharge, more queues, and access to an exclusive search menu that will allow you to easily find your next opponents quickly and easily. With premium coins in hand, you can also use them in the game’s Rituals for a chance to win free troops, resources or more coins! All in all, these are some of the best reasons for you to give the new Khan Wars X a try. So, be sure to check it out today!